On Thursday, April 14, Wilfrid Laurier University hosted the provincial competition for the 3-Minute Thesis (3MT® Ontario). The event, held at the Centre for International Governance Innovation (CIGI), featured 20 graduate students from across Ontario sharing their research in just three minutes and in plain language. Presenters were judged on their ability to communicate and engage with the audience about their research projects. The competition was tough as all presenters were winners of local 3MTs hosted by every university in Ontario. Five prizes were announced at an awards lunch that followed 3MT® Ontario. The winners received cash prizes and will all advance onto the national level, an online competition coordinated by the Canadian Association of Graduate Schools. 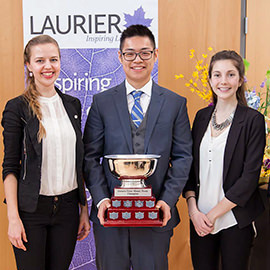 Laurier congratulates all the participants including our own Becky Earhart (PhD Psychology) who proudly represented Laurier at the competition. A recording of the 3MT® Ontario will be aired on Rogers TV on Sunday, April 24 at 2 p.m. and re-aired Friday, April 29 at 7 p.m.